Just About Anything: Happy Birthday NIKO! My dearest blogger friend Anik (a.k.a. 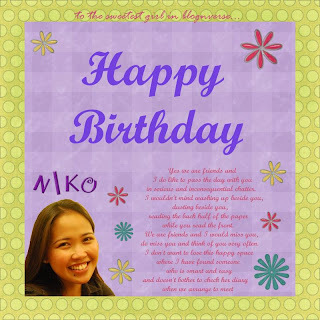 Niko or Niko Ganda to all others) celebrated her 28th birthday yesterday. I hope she had a happy and memorable one, spent with her little mushroom family. Anik is one of the first people who i met in the blogging world and came into close contact with. My first impression: sweet, thoughtful and passionate about Yena, Yobib and her blogging career. I am glad we befriended each other and I count myself lucky to have known her through blogging. She is one power girl, who believes that Girls Rule! And you will find her updated with the online trends too. So to you Anik, wishes of happiness, good health and peace of mind. God bless you always! kamz thanks a lot ha..